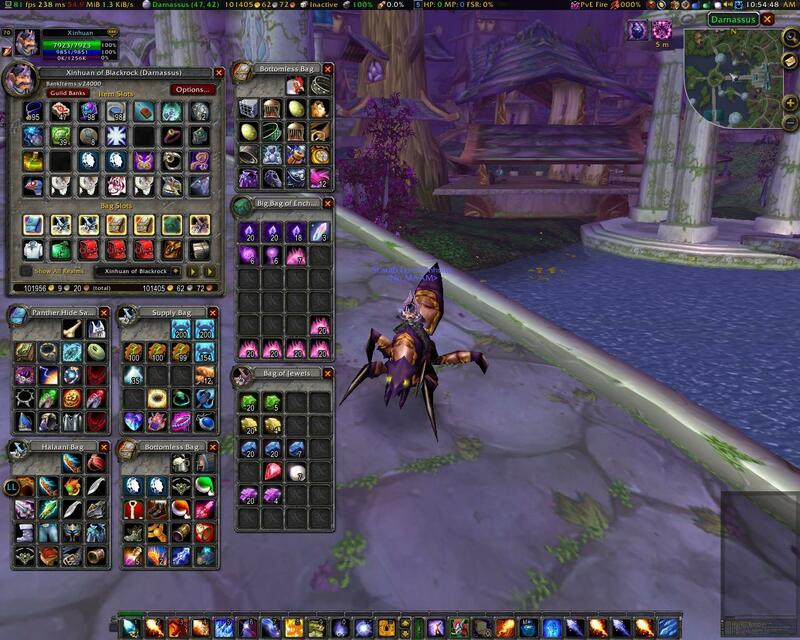 An addon that remembers the contents of your bank, bags, mail, equipped, currency, auction house, void storage and display them anywhere in the world. Also able to remember/display the banks of any character on the same account on any server, as well as searching and exporting lists of bag/bank items out. Type /bi or /bankitems to see what is currently in your bank. You must visit your bank once to initialize. Type /bigb or /bankitemsgb to see what is currently in your bank. You must visit your guild bank once to initialize. Read below for other commands. BankItems will also remember the contents of Guild Banks if you are able to view them. Use /bigb to see them. Note that Guild Banks are a shared repository and changes can occur to it by other members of your guild. These plugins allow clicking on the panel/plugin icon to open BankItems, giving a summarized view of inventory slots and money of each character on the same realm, and deleting data with the menu quickly. Most options are found in the GUI options panel. If you close your bank after retrieving/storing an item in it too quickly and the server hasn't updated your inventory, BankItems is unable to record the change to your bank when the item actually moves later. The WoW API does not give you any data about your bank once BANK_FRAME_CLOSED event has fired. Tooltip information regarding items on the Auction House, Mailbox and Guild Bank(s) may be out of date and thus be inaccurate. They will only be updated on your next visit to the respective places. Last maintained by JASlaughter, then Galmok@Stormrage-EU. Fixed an error with search results being prefixed incorrectly with "Equipped:" for items not equipped. Key bindings to Addon category. FIXED: BankItems guild bank filtering should now update while only the BankItems guild bank is open. FIXED: Moved setting of current tab above population loop for void storage frame to allow filter to work properly on tab changes. UPDATED: Updated guild bank frame to support filtering and added search overlays to tabs. Filtering will only happen if the bank items guild bank frame is shown. UPDATED: Added search overlays to void frame tabs. UPDATED: Updated closed bags filtering to remove the need for an extra function and keep variables uniform between bags. UPDATED: Merged void storage filtering back into main filter function since it was always called with the main filtering anyway. FIXED: Fixed code for page/slot adjustment in reagent bag filter and added adjustments for void bag filter. UPDATED: Make BankItems_SpecialCharactersLocalization work on more accented characters for all locales. UPDATED: Updated reagent bank frame and general bank frame to use new localized filtering. Ticket 50: Added hook for SetCurrencyTokenByID tooltip function. Should fix the issue with various ui frames not displaying counts in currency tooltips. Ticket 43: Updated mail sending/return functions to work when recipient is the full charname-realmname format (connected realms and boa mailing). Ticket 46: Updated GetAuctionItemInfo variables in BankItems_SaveAuctions function with patch from Mithdoronir. UPDATED: Bank open slash command now also supports characters on different realms using charname-realmname format. ADDED: New frames to display contents of void storage and reagent bank that look similar to the Blizzard frames. UPDATED: Void storage and reagent bank saving functions adjusted so saved variables will reflect empty slots for new frame displays. Must visit void storage on each character after update for empty spaces to be recorded and displayed properly. ADDED: New options to revert to the old method of displaying void storage and reagent bank in bags. UPDATED: Coding to various functions updated to so the old bag display method for void storage and reagent bank skips empty slots despite new save method reflecting them. UPDATED: Item button frames and functions now use the default "icon" and "Count" keys created by ItemButtonTemplate inheritance instead of concatenated global references being assigned to the "texture" and "count" keys. UPDATED: Removed global name for GBButtonAr frames since the new local keys remove the need for a global reference on these buttons. ADDED: Registered PLAYERREAGENTBANKSLOTS_CHANGED event so reagent bank contents update while crafting. UPDATED: Void storage and reagent bank saving functions now check to make sure the currently selected bag page isn't greater than the new maximum page number to avoid getting stuck in an empty bag page. UPDATED: koKR and zhTW localization. FIXED: Invalid total string position at total money frame. For use with Live Servers v5.0.5.16135. FIXED: Fixed incorrect item linking bug introduced in the last update. For use with Live Servers v5.0.5.16057. UPDATED: Add workaround for crash problems with the game client if the user has taint log enabled. FIXED: Fix the bug where a 4-slot or smaller sized bag doesn't display the bottom background texture. UPDATED: Upgrade all saved data to new itemlinks format. UPDATED: Added search filtering. Does not work for bankitems guild bank. FIXED: Remove Keyring and ranged slot + ammo (thanks iceeagle), and remove their data. NEW: Add ptBR and itIT localization files - the actual localizations are not in though. For use with Live Servers v4.3.0.15050. FIXED: Fix errors caused by patch 4.3 when visiting the Auction House. TO BE IMPLEMENTED: Void Storage/Bag search filter. For use with Live Servers v4.2.0.14333. FIXED: Fix errors with the export/search result frame's scrolling edit box. For use with Live Servers v4.0.1.13164 or Cataclysm Beta Servers v4.0.3.13117. UPDATED: All stored data for items are updated to the Cataclysm item format. FIXED: Fix bug where ammo is not registering as unequipped when you unequip ammo. FIXED: Fix error that occurs for freshly created characters. UPDATED: Items with the same name but with different itemIDs (such as heroic and non-heroic versions of the same item) are now treated as different items in the tooltips. UPDATED: Upgrade all saved data to Cataclysm itemlinks. NEW: Add "/bi open charname" and "/bi charname" command to open the bank of desired character on the same server. TODO: Currency recording is temporarily disabled. The live servers, beta servers and PTR servers are too different. For use with Live Servers v3.3.0.11159. FIXED: Ammo will no longer count double when equipped. NEW: Add support for oGlow (github version - http://github.com/haste/oGlow, not the wowinterface one). For use with Live Servers v3.2.0.10192. NEW: Added a checkbox to toggle displaying data from the opposite faction (affects both dropdowns and tooltips). UPDATED: Items on the Auction House are now shown in the tooltip information. Note that this information can be inaccurate if these items are sold or expired. FIXED: Fix rare "selfPlayer (nil value)" error. UPDATED: Remove all pre-Wrath compatibility code. UPDATED: Export now exports equipped gear as well. UPDATED: Update BankItems tooltip information to work with LinkWrangler's dynamic frame creation. UPDATED: Linking items from BankItems should now behave like the default UI (including being able to link into the AH search box). UPDATED: Significantly reduce string garbage generation. Also some code optimizations. UPDATED: When taking items from the mailbox, the tooltip information is now updated immediately. NEW: Currency tokens are now recorded. NEW: The contents of the Keyring are now recorded. NEW: Items you have put up for auction are now recorded when you visit the Auction House. These items are not included in searches or tooltips. NEW: Register a LDB launcher if LDB-1.1 is detected during VARIABLES_LOADED. NEW: BankItems will now only show/search characters and guilds from the same faction and realm. You will need to login at least once per character/guild for BankItems to save faction information otherwise these characters will no longer show up unless the "Show/Search All Realms" checkbox is checked. FIXED: Fix errors that occur when used with HealPoints. FIXED: Fix errors that occur when clearing data of a player/guildbank. REMOVED: Removed support for Saeris' Lootlink, which is discontinued and no longer works in patch 3.0.2. For use with Live Servers v3.0.2.9056 or WotLK Beta Servers v3.0.2.9061. FIXED: Fix errors that appear when opening the Addon options frame. FIXED: Fix errors resulting from the base UI code being rewritten to use locals and "self" arguments in WotLK. UPDATED: Delay creation of some 600+ child frames and textures (mostly item buttons) until they are shown (saves 50kb). Experimental. May screw up Skinner. UPDATED: Add upgrade function to convert old TBC format links to new WotLK format links. For use with Live Servers v2.4.2.8278. CODING: Removed redundant semicolons and brackets. FIXED: Fix deleted/returned flags that mark if a mail item is going to be deleted or returned when it expires. Existing incorrect flags remain incorrect until you next visit the mailbox. UPDATED: BankItems no longer stores iconpath data or itemcount data if it is 1. This results in roughly 30% reduction in savedvariable size. For use with Live Servers v2.4.0.8089. ADDED: Store mail expiry time for each item in the mailbox. ADDED: New option to ignore soulbound items that are not stackable for tooltip information. UPDATED: Moved the options window into the default UI's new Interace Options panel. For use with Live Servers v2.3.2.7741. FIXED: Add a tooltip:Show() to force tooltip repainting after adding tooltip information. FIXED: *Very- aggressively cache tooltip text that is added for performance (slight memory increase). FIXED: Switched method of hooking tooltips to improve performance (credit to Siz). FIXED: Rebuild alt-cache on returning items to an existing alt. ADDED: Added a button to open BIGB in BankItems. For older changes going all the way back to 2006, read the first part of BankItems.lua. Wanted to first say Thank-you so much for updating this mod. It is simple and very useful. Was wondering if there was away to have the class color display on the character names. Got this error just a minute ago. (*temporary) = "attempt to perform arithmetic on local 'numBonusIDs' (a nil value)"
Getting this error every time I open my bags. Yes, please update. . .I Love, LOve, LOVE this addon !! I get several LUA errors when opening tabs, etc. If you need a copy of any of these, please let me know and I'll be happy to copy and paste these to a document and email it to you !! Also, the command /bi when using to close the bank item frame does not close guild bank frame, void frame and componente bank frame. It should close all frames or just bank item frame? Regarding Public Domain, that is a no. This prevents anyone stealing the zip for re-hosting on another website for profit purposes (has happened before with the WoWMatrix debacle). Torhal is in the right of this. Most addon authors have converted their addons to ARR as a consequence of that drama. We want addons to be "open", but not at the expense of websites leeching off others work. That way it will flow back into Curse. And, yes, to help thwart it dying, name as many people as you can find as maintainers/moderators. I hate WoAce for not letting a project be truly open. that was Torheel can't come in and complain about copyright. I cloned it on GubHib and called it Public Domain, even though strictly it is still officially called "All Rights Reserved". If you do the formality of marking it as public domain, we can tag all the files as public domain. At curse comments there is again more recent version to download. Well this is a bit messy. I personally haven't played WoW for about 3-4 years, and now that BankItems has finally broken, a number of people have stepped up to fix the code! Anyone can commit to the BankItems repo, though only JackTripper has done so so far, perhaps it will be easiest if I add him as an addon maintainer so he can tag it as well? Same as before. Download, unzip to original bankitems addon folder. To be sure nobody will download old version I've deleted previous zip files. Hope JackTripper will put that update on wowace soon. New fixed version (see comments at curse.com for more details). - Void Storage self tooltips are shown correctly. - Reagent Bank is updating without need of visiting any bank. Place unzipped files in original addon folder. To JackTripper: Please copy my files exactly. Last time you skept one fix. Thanks. You skept one fix for positionig items in bagpack. When you open at bankitems ui a bag related to character's backpack items in this bag are shifted. I pulled in your fixes, committed them into SVN. The WowAce packager has the "alpha" version packaged. And turns out you can configure the Curse Client to update to alpha versions; so Curse users can actually get updates to BankItems if they opt-in to alpha updates. Anything more than that will require Xinhuan or Torheel to intervene and make an SVN tag.